At first glance the sheer magnitude of the sprawling, tangled Tokyo railway and subway system can be a little intimidating — and by a little I mean a lot. Have no fear! It is a lot easier than you would initially expect, even if you do not speak a word of Japanese. Huge maps and signs adorn the walls over the machines where you purchase your tickets, plus at every station one bank of machines is in Japanese and another in English. By knowing where you want to go and finding it on the map, it is easy to see which color line(s) to take and then from there have an idea how much change to put into the machine. Near the entrance to every station will be banks of ticket machines, one set in Japanese and the other in English. Over each row of ticket machines is a gigantic map laid out in the matching language that will have all the color-coded routes on there as well as the names and locations of each stop along those lines. My first time standing there I was no clue how the process worked but rather than stand around confused or asking for assistance, both of which would have made me look like a helpless gaijin, I just started pumping ¥100 coins into the machine there with a purpose, just bing-bing-bing, one after another. Looking back, I cannot tell you if it was a conscious or unconscious thought but I certainly approached that ticket machine like I was a man on a mission. Whether that was for my own personal mental comfort or to project the image that I knew what I was doing to the other machine users nearby. Finally I paused to look at the machine and saw numbers increasing in value on the screen but no station names. Taking another glance at the map I realized you are supposed to follow your desired route to find the end fare and that is what I was supposed to put in. Another quick scan of the map revealed that I had accidentally inserted nearly ¥600 too much. The ticket that I needed was only ¥320 but I had deposited ¥900. Examine the Tokyo railway map to determine your current location and then find where you would like to go, trace your stops and determine what the trip will cost. Once you know that feel free to begin pumping in the appropriate number of coins. The machine will spit out your ticket, just grab it and head for the platform. Upon arrival at your desired destination disembark and head for the subway gates with an attached paper ticket slot, which are usually located in the middle section of the reader bank (the outer devices are for Suica cards). If you failed to pay the full fare the machine sounds an alarm and the two swinging flaps close shut a la those classic saloon doors from the old American Western. That would be a classic gaijin thing to do, so I would advise against it. I heard it happen to someone one day, the alarm at least, but I was in a hurry and had no urge to see how that process works. Having already learned my lesson once from that ticket machine a few weeks back, I came to understand the ways of the JR lines and knew that they would never get the best of me again. So why bother learning about something when I will never ever need that piece of information? The vast majority of local residents and commuters have Suica cards that can be pre-loaded funds that allow them to bypass the ticket machines and head straight to the rail platform. After disembarking head towards the walk-through machines on the outer edges, as these are the ones on that have scanners for the Suica cards. Mayu let me use her Suica card for my final month in town and sure enough it is nothing more than a debit card or toll tag. With each swipe of the card after disembarking your remaining balance is flashed on a small screen, making it a breeze to keep track of your funds. You can also check the balance at any time using the ticket machines. Once your funds have are close to depleted simply swing by the ticket machines near the entrances of every station. After inserting your rail card you can add as much or as little money to it as you would like. The Suica card is a golden pass for everything around Tokyo but still serves a purpose in several other prominent Japanese cities and regions. It is accepted on all JR trains in Sendai, Niigata, Sapporo, Osaka, Okayama, Hiroshima, Nagoya and Shizuoka. However in Fukuoka the Suica card is accepted on trains, subways, and even a few selected buses. Aboard the trains television screens highlight the route as well as the upcoming station with visual maps in addition to speaking aloud, once in Japanese and the following time in English. Simple enough. 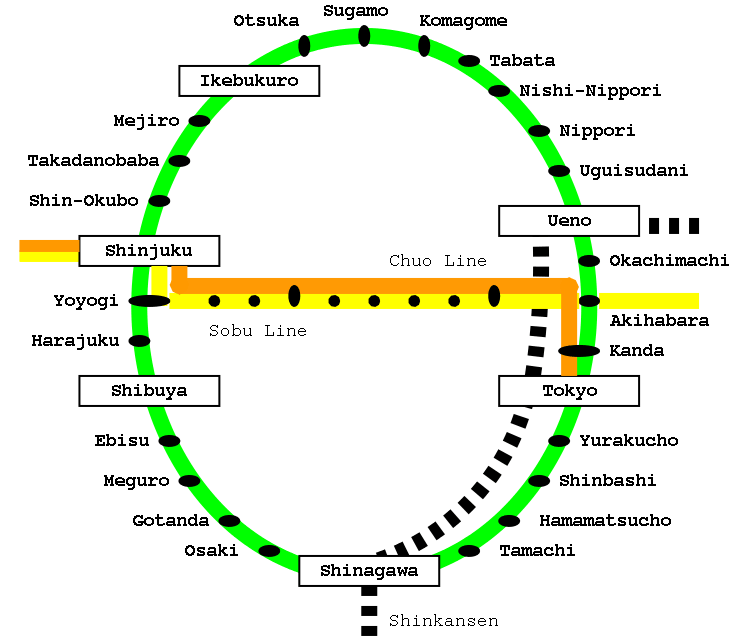 The JR Yamanote Line is the main one that goes in a circle around the heart of Tokyo, including many notable districts such as Shibuya, Harajuku, Shinjuku, Roppongi, and numerous others. Over a dozen other lines are easily accessible via the Yamanote, making practically every destination around Tokyo quickly reachable. First time in Tokyo? Ride the full JR Yamanote circle, which you can see in the center of the subway map up top and in greater detail on the map below. It only takes an hour but covers 34.5km and passes through a grand total of 29 districts in 9 different wards. It is not the most exciting adventure ever but will give you a great initial view of the city and help illustrate the varying aspects and distinctions between districts. Tokyo has had trains running through the city since the 1880s so the modern JR Yamanote line may not be quite as new as you think — it actually dates back to 1956. As a matter-of-fact only earlier this year did JR get approval to build its first new station in over 40 years! Although construction is not expected to commence until 2014, it has already been decided that the new addition will be placed in the middle of what is currently the longest unbroken stretch in the loop, the 2.2km 3-min span between Shinagawa and Tamachi stations. This will increase the total number of stations on the JR Yamanote line from 29 to 30. Currently an estimated 3.7 million passengers ride the single-lined JR Yamanote every day of the week, making it one of the busiest railways in the world. That is for one single line with a mere 29 stops, which means the Yamanote is also arguably the most transversed single line rail system in the world. By comparison, the infamous NYC subway carries 5.0 million passengers a day but that is spread out over a whopping 26 lines and 468 stations. London Underground provides daily service for 2.7 million people on 12 lines and serves 275 stations. Shinjuku Station is the most popular stop on the JR Yamanote line, as well as the single busiest rail station in the world as certified by Guinness World Records. As the main rail traffic hub between central Tokyo and the western suburbs the station offers nearly three dozen connections and sees nearly four million people pass through it on a daily basis — but even those stats are five years old. Shinjuku district itself is a commercial powerhouse and home of the Tokyo government, making this area one of the busiest and most important districts in all of Tokyo. How were your experiences riding the Tokyo trains?